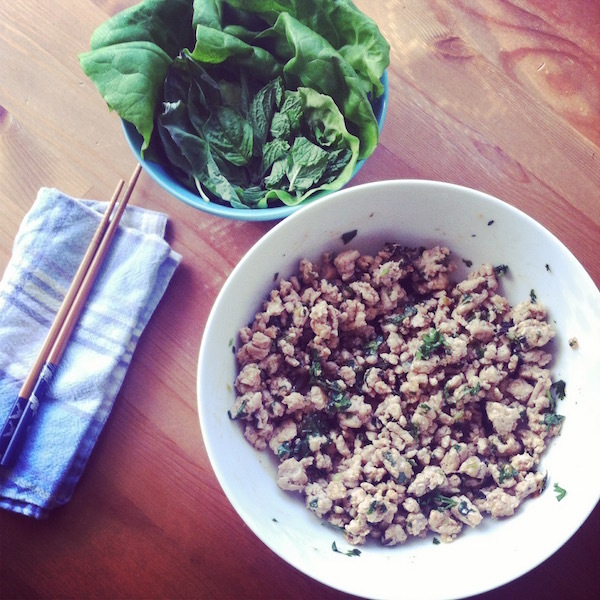 Have you ever had larb gai before? It’s delicious. It’s like a healthy Asian taco. I know, if you haven’t had it before, it might sound weird. But, let me break it down for you. You make a delicious filling of ground chicken that is seasoned with scallions, lime juice, jalapeños, and fish sauce. You take this yummy filling and you fill up a lettuce leaf, like you would a soft taco shell. Then, you might toss some herbs or shredded carrots or cucumbers up in there. Roll up that little taco and stick it in your mouth! The zing of the lime and the heat of the pepper are perfectly balanced with the freshness of the herbs. Yum. Fun to make. Fun to eat. And healthy to boot! I had this for the first time years ago at a Thai restaurant and loved it. I had a craving recently and decided to look up a recipe and see how complicated it was. The answer is, it is not complicated at all. You might already have all these things around your kitchen. This is the kind of main dish you can make and not feel bad about all the egg rolls you eat with it. In a skillet, drizzle in some oil and turn the heat to medium high. Saute the shallot and jalapeño until they begin to soften. Add the chicken and continue until chicken is cooked through. Pour chicken in a mixing bowl and add all other ingredients, stirring to combine and taste. Adjust seasoning as needed. To eat, grab a lettuce leaf and spoon chicken mixture in like a taco, topping with fresh herbs and other vegetables as you like. Wrap it up and munch it down!